Your newly built Florida vacation home rental is set on a prestigious premium lot in the Sanctuary of the Glenbrook Resort Community. 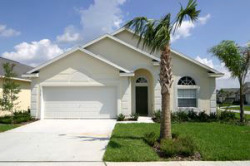 Located just 7 miles from Disney World, this is truly the vacation home rental resort of the future with a resort style clubhouse and recreation center, complete with tennis and volleyball courts, exercise facilities, a large communal pool and on-site Management available for 24 hr guest services! 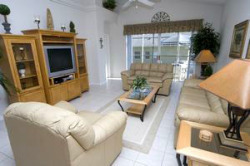 The vacation villa comfortably accommodates up to 10 guests. 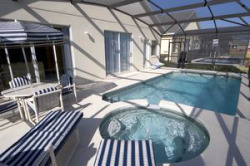 It has a private pool (additional charge for heating), adjoining hot tub, Jacuzzi and extended deck area. Space and luxury abound in this home. Each room has been carefully furnished and decorated by the owners to meet their own demanding standards. It features a large comfortable Family Room with a queen sized sofa bed, a 36� flat screen color TV and a Playstation II, giving access directly to the deck and a private pool. The living room is for those quiet moments to just sit back and relax. The formal dining room provides an elegant setting for that special meal, or for entertaining. The full sized kitchen has all basic appliances, including a large fridge/ freezer with icemaker, and a breakfast table. The utility room has a washing machine, tumble dryer, iron & ironing board. The master bedroom, with its own Jacuzzi whirlpool and sitting area providing access to deck and pool, has a king-sized bed with a large walk-in closet, TV & DVD player. The second master bedroom has a queen-sized bed, large en-suite bathroom (tub with spa jets, large shower and sinks) and TV & DVD player. There are also two additional bedrooms, one with a twin beds and the other with a set of Disney bunk beds. Each bedroom is also equipped with a alarm clock and a TV. Key collection for the villa is a short distance away in the Clubhouse. A resort community featuring on-site staff and services for all your needs. On-site check in and check out services. Convenient on-site key pick up / drop off. Recreations of all types including volleyball and tennis. Neighborhood Clubhouse completes with game room (a Pool / Billiards Table and Air Hockey), exercise room, media room, and meeting facilities and is open 24/7. The communal pool is open all year round from dawn until dusk. A wonderful feature of this superb pool is the fountain. Balance to be paid - 10 weeks prior to ar to arrival.